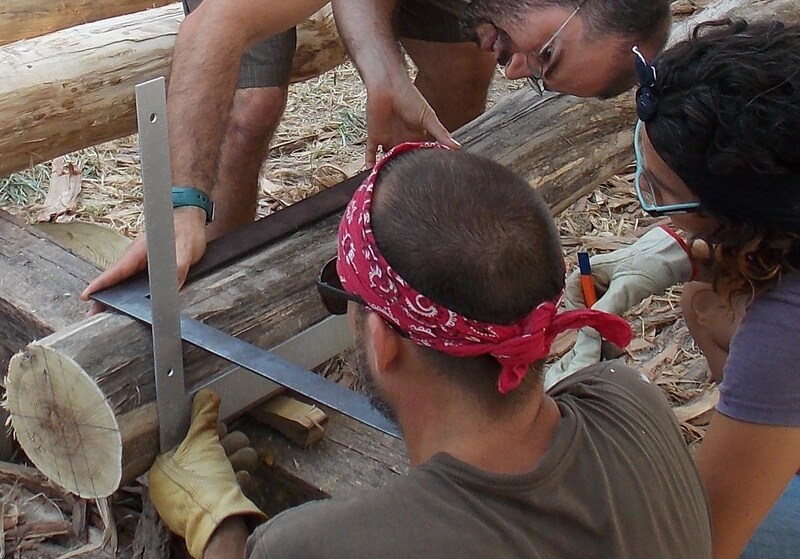 Timber framing workshop at Dancing Rabbit brought new skills for natural building. Here, students make square connections with round logs. This week the summery weather came back after a spell of morning sweatshirts and socks to bed. In times like these I often feel grateful that the weather is not something we get to choose. Imagine a meeting wherein the timber frame workshop participants and tomato growers, homesteaders and beer sellers, wind and solar generators alike, and folks with all different tastes and information got together to decide how hot, how sunny, how windy, and how rainy a given day should be. I’m sure we could come to a reasonable agreement, and I’m glad we don’t have to. Hi, this is Sam. This week I’m especially conscious of what I put in this column, seeing as at the meeting yesterday it was brought up how important good writing is and how much of an effect the content of our email newsletter can have on those who read it. Dancing Rabbit’s mission is to help educate folks about how to live more sustainably. We have to try to find ways to build, eat, govern, travel, work, play, parent, and clothe ourselves better, so we can share those with you and anyone else who might be interested. So, it’s a big deal, writing this. Yesterday’s meeting was one of the two meetings each year in which we work on staffing the (more than a hundred) positions that keep DR functioning. We need someone to be in charge of our recycling, an organization secretary and accountant for each of our official entities, a committee to handle matters having to do with pets, and a committee in charge of building our new common house, just to name a few. Some are paid, some earn credit with the utilities co-op, and some are strictly volunteer. We managed to get good suggestions for filling the holes we needed to fill and now it’s up to the Oversight Team to work out a proposal for the composite staffing situation. In other news, Rae and Illly’s timber frame workshop is underway, and their house is taking shape. So far I haven’t seen anything new go vertical (and I walk past the site several times a day) but I have no doubt that it will get done. It’s uplifting to me to see beginners take up tools and learn to craft–and actually participate in crafting–an object as useful and personal as a house. I’m excited to think of the knowledge of timber frame techniques spreading from this moment and this place. On a more human scale, this week many of the tri-community kids went back to school, started school, or are getting ready to start school, however “school” manifests for each child. A couple transitioned from home school to public, one from public to home, and a handful will begin home schooling this year. One of my favorite sights this week was my son and a few of his friends running around the pond, catching crawdads and other critters in the mud. Their faces, gestures and minds were all so bright and open in that moment. I might complain about having to run county water to keep my pepper plant alive, but the water level being pretty low is good for the kids’ play, not to mention their science education. Dancing Rabbit is an intentional community and educational non-profit in Rutledge, Missouri, focused on sustainable living. We offer a tour on the second and fourth Saturdays of the month, April through October. The tour starts at 1:00 PM and generally lasts one and a half to two hours. You do not need to make a reservation for regularly scheduled Saturday tours. For directions, call the Dancing Rabbit office at 660-883-5511 or email us at dancingrabbit@ic.org.